Brunch is my favorite meal of the day. Granted, since I work full-time it’s usually reserved for the weekend, but if I could enjoy a leisurely mid-day meal full of sweet and savory belly-filling items and bottomless coffee, I would. Alas, I’ve resigned myself to the fact that I can make this ideal event a treat a few weekends a month, so says my schedule and my wallet. If you’ve dined with me, my tastebuds aren’t the cheapest. I am a sucker for ambiance so long as the food is on par as well. Claire’s on Cedros, Solana Beach: I’ve ordered the green scrambles to the creamy benedicts and sweetened carbs (french toast, pancakes, or Claircakes, made with Cinnamon) and have never been disappointed. If I’ve got an extra fiver I’ll add a vanilla latte. On sunnier afternoons I’ll request a table out back. The restaurant feels like a cozy cafe and is set in an intimate, eco-friendly bungalow. Everything in the place is either upcycled, repurposed or energy efficient and built to make a minimal impact on the environment. They even have electric vehicle parking stalls right out front. 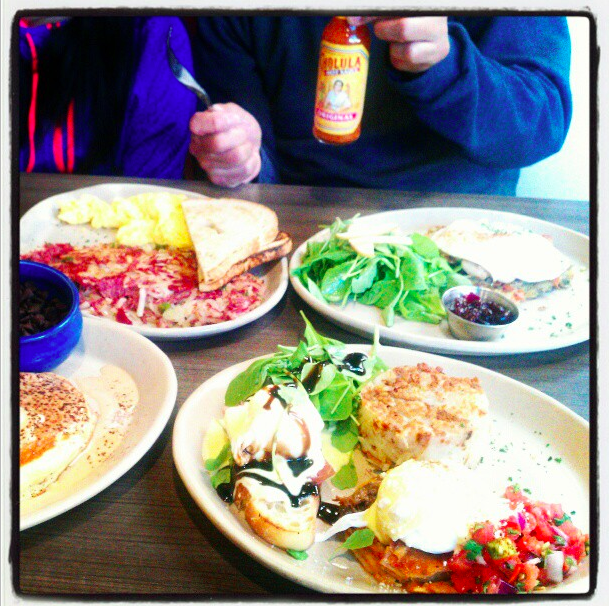 Snooze, Hillcrest (and now Del Mar): I have to tip my hat to my best friend, a former Denver transplant for introducing me to this breakfast-only joint. As a chainlet in the Mile High City, its San Diego locations are just as busy, but I don’t mind. The complimentary coffee is strong and the wait is worth it. I usually rotate between their homemade corned beef hash or the breakfast pot pie, though they’ve also got a selection of fun pancakes (like red velvet!) and an extensive Bloody Mary menu. With the Hillcrest location’s roll-up garage windows, high ceilings and fun pod-like booths, I could loll around Snooze for hours. H/t noted! And this post is another tally in the kinship column. Brunch is also my favorite meal. I think as a portmanteau, the word itself means I can eat as two meals worth in one sitting, no?